We believe people change organizations. So we built Workplace by Facbook to empower them. Our mission is to unlock human potential by giving the world a place to work together. We do it by combining next-generation technology and easy-to use features to transform communications, culture, and workflows inside organizations of all shapes, sizes, and industries. Industries like retail. In this playbook, we’ll explore the new consumer expectations shaping the future of retail in APAC. You’ll discover why great brand experiences for your customers start with great work experiences for your employees. 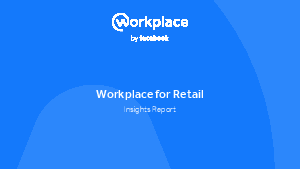 ?Download this whitepaper now to learn more about the benefits of customer-centric collaboration tools like Workplace by Facebook.